It’s no secret that the kitchen is the centerpiece of the modern home. It’s the primary part of the house that a seller renovates before placing their home on the market to get the best asking price. It is the also the one area that people constantly remodel to bring up to date, to provide more functionality, and to have the space align with their personal preferences. Homeowners spent, on average, about $19,100 in kitchen renovations in 2017. Not surprisingly, according to the industry experts who gather every year at the Kitchen and Bath Industry Show (KBIS) hosted by the National Kitchen and Bath Association, the kitchen is also the space that unlocks the value of a home. With today’s open layout, the kitchen’s interior design style has expanded to match the theme of other areas of the home, such as the dining room and living room spaces. This has opened up the floor for designers to look at the kitchen as the deciding vote for design decisions across other rooms, and could increasingly entice appliance OEMs to evolve their products to meet the homeowners’ changing design demands — from the kitchen outward. A homeowner isn’t just looking for a modern and functional kitchen. Now, a homebuyer will seek out high-end and upscale appliances that provide an elegant and luxurious feeling the moment a person walks into the space. The popularity of luxury kitchens featuring smart technology and chef-quality appliances is on the rise. Even with modest budgets in play, homeowners will splurge a little more to have an upscale aesthetic and functionality achieved across cabinetry, countertops, and matching appliances. Whether it’s represented in the luxury touches added to appliance handles, decorative metal trim around shelving in refrigerators, or in a willingness to pay premium for stainless steel appliances with glass accents and advanced technological capabilities (see smartphone app synchronization and cameras) — if the money is available to spend, the kitchen will get its fair shake. What Does This Mean for Appliance OEMs? The evolving kitchen design trend is placing an appliance manufacturer in a unique position: Be the catalyst that meets the demand for an “integrated aesthetic” in the modern home. Appliance OEMs seeking a partner will benefit from relationship with a manufacturer who can handle the changing demands of the market by providing diverse capabilities in both forming and finishing while still keeping their manufacturing costs low. From a design perspective, this could empower OEMs to begin translating design aesthetic across the kitchen and into other areas of the home by integrating similar finishes, textures, and shapes into their products. It’s also a cost saving and overall product improvement opportunity that can only leveraged without a multiple-vendor approach. Essentially, finding a partner that can merge value-added processes into their existing capabilities, such as sub-assembly of oven windows or decorative metal trim around glass refrigerator shelving, allows the OEM to save on costs while working with a partner to achieve quality control from the design phase onward. We have seen a growing trend in OEM appliance requests focused on high-end, unique finishes, textures, and shapes, and we can bring a lot of value to the table in this respect by offering customers flexibility in metal treatment types and finishes to help them reach their desired vision. For example, we can finish a brushed aluminum handle or stainless steel handle with a tinted clear coat. This makes the brushed aluminum or stainless steel handle appear to “pop out” by adding more depth and color without hiding the original brush layer that is underneath. This is also something we can achieve on a cross hatched or Knurled pattern with a tinted clear coat to add color while maintaining the handles interesting texture. Finally, we can provide a range of tinted clear coats to offer an upscale finish for premium appliances that are popular with OEM designers — including a black tinted clear coat or a more unusual tint such as rose gold and bronze. Our customers turn to us for the expertise and process capabilities to design and manufacture appliance handles and trim using various techniques such as hydroforming, roll forming, and tubular stamping. 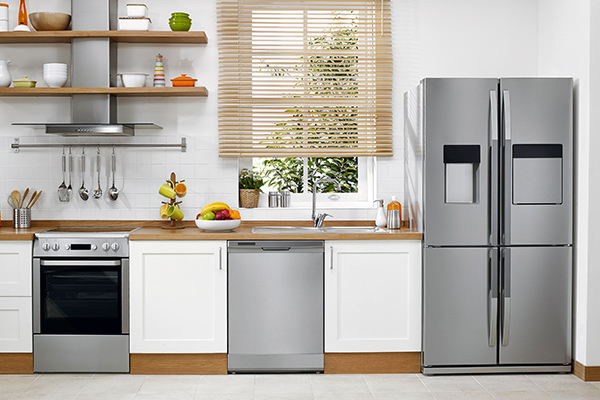 Combined with superior Class A finishes using powder coating, plating, vinyl cladding and stainless steel finishing techniques, we can help appliance OEMs achieve the premium appliances aesthetic that are desired in both today’s and tomorrow’s luxury kitchens. To learn more about how we can help you achieve highly aesthetic, superior appliance parts for the kitchen, please contact us today.